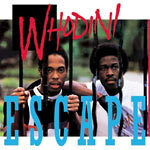 Whodini's reign on top of the rap world may have been short-lived, but no other group captured the spontaneity, creativity and showmanship of hip-hop's early years like this New York trio, and never as powerfully as on their 1984 sophomore album Escape. Having introduced their funky, danceable aesthetic the year prior on their self-titled debut, Escape built upon that foundation by expanding their sound with bigger arrangements and sharper performances from rappers Jalil Hutchins and John ''Ecstasy'' Fletcher. The result is not just Whodini's best album, but one of the defining works of the era. Led by the monster single ''Friends'' (which Nas sampled for his biggest hit ''If I Ruled the World (Imagine That)'' over a decade later), the album produced the smashes ''Five Minutes of Funk'' and ''Freaks Come Out at Night,'' songs that helped establish hip-hop as more than just a passing fad and a commercial force on the radio. Having been out of print for years, Traffic Entertainment Group is proud to present Whodini's landmark album in a special edition, packaged in a deluxe slip case box, featuring audio remastered from the original analog tapes and additional instrumentals, a capellas and 12''-only mixes never before released on CD, plus poster with artwork based on the original 12'' single design.